MERRILLVILLE, Ind., February 21, 2017 – MonoSol, LLC, a Kuraray Division and the world leader in water-soluble film technology best known for its film used in detergent unit dose products, is helping clean the world in a different way. 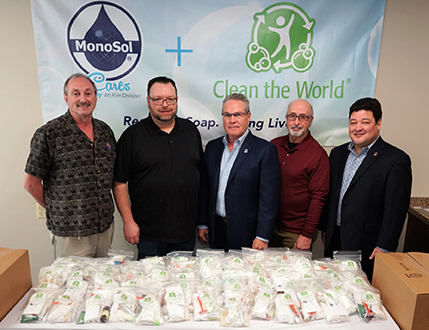 Partnering with Clean the World, a non-profit enterprise dedicated to saving lives by distributing recycled soaps and hygiene products from hotels to at-risk families, MonoSol hosted a Pack-a-Thon at its Merrillville, Indiana, USA headquarters on Feb. 20. At the Pack-a-Thon, MonoSol employees from around the world came together to pack 1,000 hygiene kits that will be donated to local charities that serve those in need. The Clean the World kits include nine personal hygiene items, such as a washcloth, bar of soap, lotion, shampoo, conditioner, a razor, and a tooth brush and toothpaste along with a note from MonoSol. And the Portage Township Food Pantry, which assists families in crisis situations living in Portage, Indiana. The Clean the World Pack-a-Thon is just one of the many activities MonoSol participates in to benefit organizations, including the Food Bank of Northwest Indiana, RossTownship Food Pantry, Portage Township Food Pantry, Toys for Tots®, Parents and Friends and State Street Community Church. MonoSol’s water-soluble film technologies have revolutionized detergent and cleaning industries all over the world. Our water-soluble packaging design helps create products that can deliver exact dosage, easier handling, greater convenience, and safety and sustainability. MonoSol’s growing portfolio of applications includes detergents, agricultural chemical products, personal care products, food manufacturing, pool and spa, transfer printing and more. Through our collaborative mindset, global manufacturing footprint, high-quality products and scientific expertise, we partner with our customers to create innovative product packaging solutions that enhance everyday life. Founded in 1953, MonoSol, LLC is a division of Kuraray, one of the world’s leading specialty chemical companies, and is based in Merrillville, Indiana. For more information about MonoSol, please call +1.219.762.3165 or visit www.monosol.com. Clean the World is a social enterprise dedicated to the mission of saving millions of lives around the world while simultaneously diverting hotel waste from landfills. Clean the World operates soap recycling centers in Orlando, Las Vegas and Hong Kong, and leads a “Global Hygiene Revolution” to distribute recycled soap and hygiene products from more than 4,000 hotel and resort partners to children and families in countries with a high pre-adolescent death rate due to acute respiratory infection (pneumonia) and diarrheal diseases (cholera)—which are two of the top killers of children under the age of five. Since 2009, more than 30 million bars of Clean the World soap have been distributed in 100 countries. Clean the World provides hygiene kits to relief organizations throughout North America. More information: CleanTheWorld.org.